If you are you an avid fisherman who loves fly fishing, constantly on the prowl for the perfect lure, or are you a collector of antique lures? The golden-eyed Heddon River Runt Spook illustrated in this jigsaw puzzle was produced in the 1930s by James Heddon & Son and sports a 2 ½ inch long plastic body with 2 piece flap rigging. Boasting a weight of only ½ ounce, this little lightweight lure gives the angler more control of the depth the lure can travel. 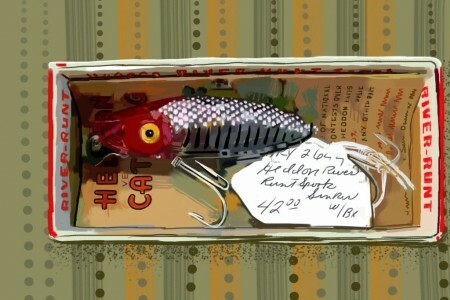 These lures were favorites in by-gone days because they could attract anything from perch to bass. The gritty glitter like material on the surface of the silver flitter and the red head make it an appetizing lure for any hungry fish.